Do you ever feel like you’ve lost heart? Have you been persevering for a long time, but you’ve gotten tired? Do you feel like you just can’t go anymore? Papa God has a supernatural answer for you today. That verse really hit me recently. I was praying and telling the Lord how tired I am. I need Him give me a steadfast spirit and keep me going. I need Him to give me strength and will to hang in there with everything He has called me to. And I thought of Secretariat. If you aren’t familiar with him, Secretariat was a horse… one of the greatest racehorses of all time. He won the U.S. Triple Crown (sweeping the Kentucky Derby, the Preakness Stakes, and the Belmont Stakes) in 1973, and he is one of only eleven racehorses ever to do so. Secretariat was amazing. He ran and ran and ran and ran, because he LOVED to run. He had no equal; he was special. As a matter of fact, in 1999, ESPN named him the 35th greatest athlete of the 20th century. But Secretariat had a secret. When Secretariat died in 1989, a necropsy (an autopsy for non-human bodies) was performed. Guess what the veterinarian found who performed the procedure? He found that Secretariat had a HUGE heart. An average horse heart weighs 7.9 pounds (3.6 kilograms). 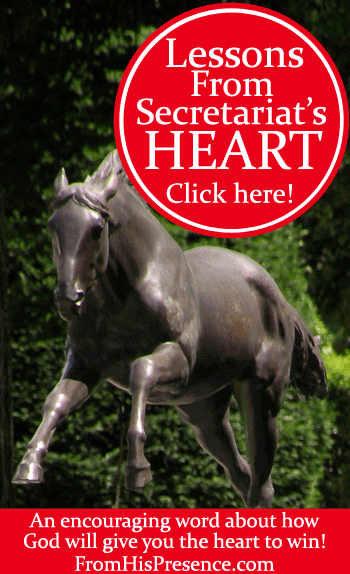 Secretariat’s heart was not weighed, but it was estimated to weigh 22 pounds (10 kilograms). Secretariat’s heart was over 278% bigger than the size of a normal horse’s heart. Secretariat was great because he had a huge heart. He could run and run and run because of the size of his heart. He completed some of the most impressive athletic feats of the 20th century because of his enlarged heart. Why does that matter to you? Because God has promised to enlarge your heart too. Do you want to fight your fight AND WIN? Do you want to work out your own salvation with fear and trembling (Philippians 2:12). Do you want to finish your race well? I know I do. I want to be found faithful. But I need an enlarged heart. I need a big heart to see people and situations the way God does. I need a big heart to keep running my race without getting tired. I need a big heart to stick to it no matter what. I need a big heart to believe that God will come through for me in everything, even when I don’t see the answer to my prayer yet. I need a big heart to love and serve like Jesus loved and served. The good news is that our Heavenly Father has promised to give us a big heart. And because of that big heart, we will each run the course of His commandments. The commands God gives us are not too hard (1 John 5:3; Deuteronomy 30:11). With His help, we can obey Him. We can stay on track. Moment by moment, day by day, if we will ask Him for help and for that enlarged heart, we can run the course of His commandments. RUN. That means we can do well. We can be athletic about pursuing and obeying Him. We can be victorious. We can win this thing. All because He gives us an enlarged heart. So I’m asking Papa God to enlarge my heart. I’m asking Him for a HUGE heart so I can run my race and win. I don’t want to just finish it; I want to sweep it. I want the Heavenly Triple Crown. What are you struggling with today? No matter what you’re dealing with, if you will ask God to enlarge your heart, He will. He will help you live moment by moment, abiding in His love. He will help you obey Him every second of every day. If you ask, He will keep you in His perfect will. He can keep you from sinning against Him if you ask for His help and submit to His commands. You, too, can run the race of God’s commandments AND WIN–because He will enlarge your heart. Will you ask God to enlarge your heart today? Image courtesy of Matthew D. Britt on Flickr via Creative Commons license. Great word Jamie, thank you! Wow, this blog has SO blessed me and I’ve sent the link on to friends and really want to bless my church ladies discipleship group too by sharing it with them! Thank you SO MUCH for the encouragement. God bless you and keep blogging! I’m so thankful it blessed you, Venetia. I pray Papa would enlarge your heart today even more as you run your race!! The message and clip is Beyond IMPRESSIVE! It’s an eye opener when you see this horse and identify where you are in your spiritual race with God. I NEED God to enlarge my heart and WIN with him and through Him every time! Thanks Jamie for your ever impressive messages, God Bless You Indeed! I’ve become so much more knowledgeable and intimate with Jesus in my prayer life. Through your teachings I’m able to spread the gospel to others, teach them how to use the Promises of God, Personalise it and Pray it back. I learned that from you Jamie. Eating the Word of God from your spiritual boards is like manna from heaven, its Enlightening, Fresh and Savoring because it has God’s scriptual promises to back it up – Thank You Jesus for Jamie! Thank you for this post today. I needed it from the bottom of my heart. I need to not grow weary when I see others hurting. My heart hurts for so many, but I have to remember to always trust him. He is still in control and on the throne. He is my creator and my King. Love this Jaime! I need this and will pray over this verse. Loved the video of the great Secretariat too.